You are the mayor of a new city. Build your city from the ground up by setting residential, commercial and industrial districts, and provide them with transport links, power and facilities. Your aim is to sustain a happy city within your budget. Set taxation each year to bring in more money, and spend it wisely on ensuring your citizens have enough places to work, and aren't choked by crime, pollution or traffic. The better your city is, the bigger it will grow. You are helped along the way by your assistant, Dr. Wright, based on Sim City creator Will Wright. 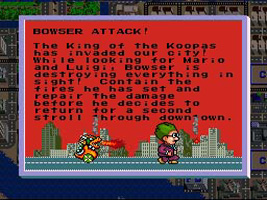 One of the disasters that can befall your city is an attack from a giant Bowser from the Mario series. He destroys everything in his path in his search for Mario. 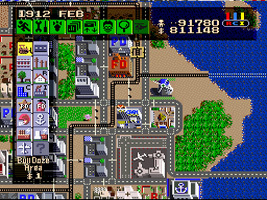 One of the scenarios you can play is set in Tokyo, Japan in 1961 where you must rebuild after a Bowser attack. When the number of citizens in your city reaches 500,000 you receive a gift prize: a statue of Mario. When you place it somewhere in your city the first few notes of the Super Mario Bros. Ground theme play. There are six scenarios in the game and two more that can be unlocked. 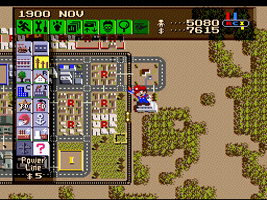 One of the unlockable scenarios is called "Free City U.S.A.", set during 1991 (the year this game was released) and your only task is to build Marioland. 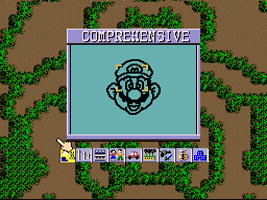 The only geographical feature is a forest in the center of the map in the shape of Mario's face.